Real Fyre RDP-2-24 Golden Oak Designer Plus Vented Gas Logs, Logs Only, See-Thru, 24-Inch. The Real Fyre Golden Oak Designer Vented Gas Logs offer a premium artificial gas log set for use with your indoor gas fireplace. This log set features a refractory ceramic design that’s reinforced with steel rods for incredible durability so you can enjoy your fireplace for years to come. These logs are hand-painted with careful detial, as well, to provide one of the most realistic log set designs available on the market. This set features a Golden Oak Designer Vented design and 24-inch width. In addition, this set features a “see-thru” design to allow for a full view in two-sided fireplaces. 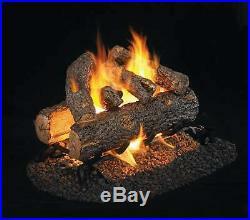 Refractory ceramic artificial log set for indoor gas fireplace. Hand-painted in exquisite detail to provide a realistic, natural appearance. Durable ceramic design reinforced with steel rods for superior durability. Overall log width: 24 Inches. Item(s) must be in new condition, with all original accessories and in the original packaging. We are happy to assist you! The item “Real Fyre Golden Oak Designer Plus Vented Gas Logs, Logs Only, See-Thru, 24″ is in sale since Tuesday, August 7, 2018. This item is in the category “Home & Garden\Home Improvement\Heating, Cooling & Air\Fireplaces & Stoves\Decorative Logs, Stone & Glass”. The seller is “spotixinc” and is located in North Liberty, Iowa. This item can be shipped to United States.